I'm so excited about the card I have to show today. It is one of my favourite cards I've made in a long time. 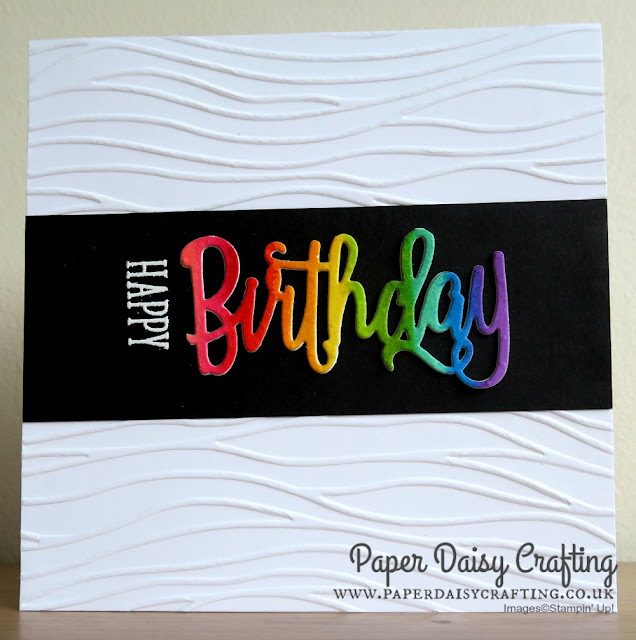 No new products on here apart from the inks - and boy, did I have a LOT of fun playing with our new colours. Unbelievably I have used 11 different colours to make my rainbow but I'm so happy with how it worked out. I've listed the colours in the product list below if you want to recreate it. I made this card for my sister whose birthday was a few days ago - hope she liked it. 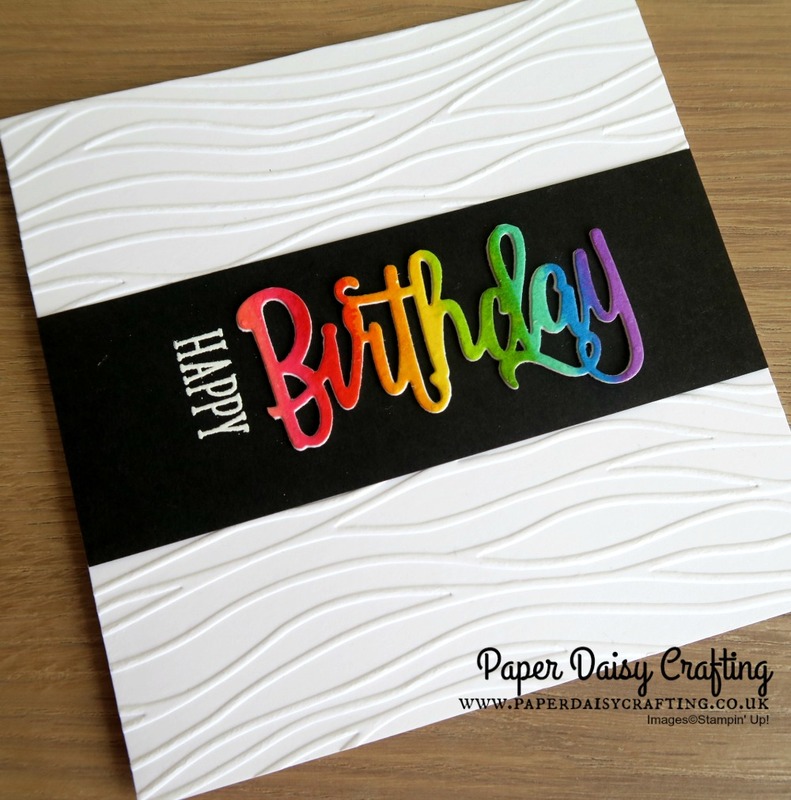 As well as from the Happy Birthday thinlits die, I've used the lovely Seaside embossing folder and my little "HAPPY" is part of a masked stamp from "Happy Birthday Gorgeous"
Can you see how thick the "Birthday" looks? I hope this photo helps. 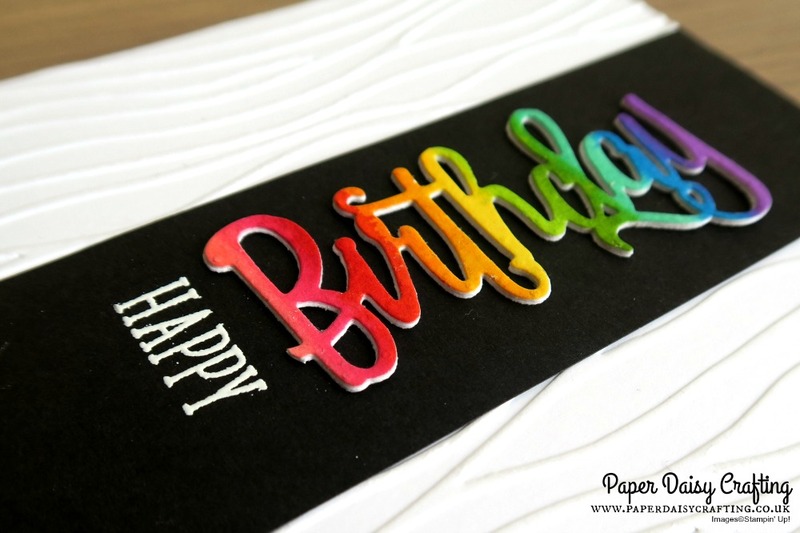 I have cut out several "Birthday" in Whisper White and layered them beneath the rainbow coloured word. Would you like to see how I did it? Watch my video tutorial HERE of click on the image below. Don't forget to use my Monthly Shopping Code when you are ordering online through my shop - the Stampin' Rewards are accumulating nicely and I use these to buy products for everyone who has used the code which you will receive as a free gift in early July. Also, don't forget to subscribe to my newsletter for updates, offers and news from me and Stampin' Up!